Sorry if I'm a day late, really wanted this up yesterday but things happened and I got busy. So anyway, I've been wanting to do this for quite some time now but I'm glad I decided to wait. I couldn't have chosen a date more perfect than Women's Day! When I was younger, I didn't care much about money. I always relied on other people (ie. my parents) for my needs. Now that I'm older and wiser, I realize how important it is for women to have financial freedom. Not just to be able to buy the things we want but more importantly, to be able to make independent decisions. I started Beach Born last year after years and months of prodding from friends and relatives. You see, I've been using and giving away this spray for a couple of years before I decided to monetize it. The initial reason why I created it was because I was spending a ton of money on imported sea salt hair sprays that I wasn't 100% satisfied with. That's when I decided to do research and testing to create a product specifically formulated for Asian hair. My secondary reason is to be able to fulfill my dream of having BEACH BORN BARRIOS: Farmed land where men plant and harvest the ingredients I need while their wives/women assemble the product. A sustainable, fair-trade village that can create multiple incomes per family. We are trying to make a difference by sponsoring children via World Vision and offering affordable reseller programs so women, men and students can make a bit of income on the side. That being said, I've decided to giveaway a BEACH BORN BUSINESS package to one lucky reader! 2 others will get consolation prizes. To qualify for the consolation prizes, just fill up the form and you're done. I've always wanted to have my own business because I wanted to be a stay-at-home mom. I don't have a kid yet and my husband and I are planning to have one next year. Having a business would be a good start for us. I want to focus on taking care of my family at the same time helping my husband earn. I want my own business that would enable me to work from home with flexible working hours, and still be hands-on in molding my child's young mind. As a homemaker, being able to guide and support my daughter through the complexities of growing up without any worry that I'm missing out on anything by working is my priority. And having my own business would help augment income without taking much of my time at home. As a housewife I really want to have an own business to help my family and to have my own income and to buy my personal needs. Everyone wants to have their own business,and i am one of them,i want to have my own business beacause it is better to have a business than you are an employee only, aside from the fact that you own your time meaning you can give time with your family especially with the kids, and you can be the boss of all the boss. Having own business is the best promotion that we can achieve in our life.. thank you for a chance to win a business package.. This is really a great opportunity for someone like me who really love and wanted to start a business for my childs future.My husband have work but to be more stable I really wanted to have my own income. I would really love to start again and bring back the confidence in me .I love talking and dealing with people. And to win this is really one of the biggest blessing that me and my family will receive. Thank you for this rare opportunity ,givingus a chance to start and lift our spirit and morale as a woman . Im a full time mom. And my time is mostly on house chores and taking care of my kids. But I always dreamed of putting up my own even small business. But I dont know how or when. If I'll be chosen, this is a great oppurtunity to me to show my skills and ability on business. To regain my self confidence. It would be my stepping stone on my career path towards my self fullfilment and success. It's an amazing giveaway. I am a full time mom while my husband is OFW in Riyadh. We're paying debts and starting to save money to build our house (malapit na po kasing bumagsak ung old house na tinutuluyan namin). I have been thinking of business na pwede ko istart so I could help my husband save money. My daughter will be going to school na this year and we're the one who pays the bills and other expenses sa bahay kasama ang lola at mother ng husband ko. I have tried looking for a job but its hard na since I am already 29 and not working for a very long time na since I became a full time housewife/mom. The BEACH BORN BUSINESS package will be a great help and the fulfillment of my dream to have my own business while I take care of my daughter at the same time. I really want to help my partner with our finances. I know he wants me to stay at home and take good care of our daughter but still I want to do something that he can be proud of me and also can help us. I am a SAHM looking after my kids. I need to work but I'm torn about leaving them to go to work or just work at home. I do online work sometimes but it is not enough for our needs and I am looking into having a small business so I can manage my own time thus giving me time for my kids. It is really hard being a mom who is a hands on who needs to work. I don't want to sacrifice my time for them if ever I decide to be employed somewhere. Thank you for giving us a chance. I want to start my own business because I believe that I can be rich not by being an employee but being an entrepreneur. I am a working mom and my project required me to go on night shift since February last year up to this very day. It is really hard for a mom like me juggle work and office and to stretch my time to meet my family's need while I only get less and staggered sleep. My situation really made me realized that it is hard to be an employee though I am getting stable income, health and other benefits, but there are lots of time that our finances is enough or we are just making both end meet. I am a people person and I know in my heart and with my ability to relate to people will incline me to be a good business woman. I wanted to start a business and soon groom it because having my own business mean I am my own boss and I can devote more time to my three year old daughter who needs my guidance in her growing and formative years. It will be a good feeling and assurance that having my own business is the right track for me. Equipped with trainings and proper guidance on how to run cart business will lead me to a path of success and financial freedom. i need wedding/honeymoon/travel fund and thinking of letting my hair down during that day so i wanna try this out haha. i want to help make that barrio a reality! I believe there is greater opportunity in having my own business than being an employee for the rest of my life. I will be able to help my parents, support my own family, and pass the business to future generations. Winning this specific giveaway will make it much more fulfilling because not only have I helped you take a step closer to your dream but I fully support your advocacy since we also sponsor children through UNICEF. Looking forward to trying your locally-made product! The main reason I choose to set up a small business, is because it gives them independence. They also reap the rewards for themselves; these are two powerful incentives.. More of stable and time management and also your the boss! I'm currently a stay-at-home mom. My son is starting school soon, so I'm considering going back to work since tuition fees are quite expensive these days. I really want to try my hand at running a business, since it will allow me to keep a flexible schedule, but most of the concepts and franchises I've looked at so far are those that are interesting but which I'm not really passionate about. On the other hand, I love your dream of having a Beach Born Barrio. It's something I can behind both as a consumer and as a potential retailer. Plus, I think that the product is something that a lot of people I know may be interested in. Isa akong SAHM dapat talaga may sariling income ang isang katulad ko para incase of emergency may madudukot akong pera na naipon. Mahirap din umasa kay mister dahil lahat ng expenses ay sagot nya at sya lang gumagastos para sa bahay at sa aming mag-ina. Maganda magkaroon ng small business ang katulad kahit nasa loob lang ng bahay. I wanna be my own boss, managing a business that's not just merely to gain an income but also be passionate about the product I'm selling. I think, that's how a business will thrive aside from of course, be hardworking and knowing your market. Ever since, I love using and trying new beauty and hair products. I've been seeing Beach Born Sea Salt Spray around social media which led me to research about it and haven't found any rants, wow I'm sold! What I like about it too is that it's all natural and can also be used as a dry shampoo. This may sound celebrity-ish, but it's true that I also wouldn't endorse/sell a product I don't believe in. I really hope to win the business package, it will be like hitting 2 birds with 1 stone. I'll be able to help my family with our expenses at the same time have fun doing what I do. I want my own business because its the only way I can help my husband in supporting and providing for the needs of our kids. Having my own business gives me the flexibility I need to earn money without compromising the attention I need to give my 8-yr and 3-yr old boys. Given the opportunity, my husband and I would like to become entrepreneurs and join the ranks of people who've gone from rags to riches. I want my own business of course to earn money on my own and will to give my kids needed not just for now, until their future needs. As a Single Mom, I know its hard now raising them alone but I know it'll be so much harder raising them alone when they grow up. So I need more money because somehow I'm afraid that their father sooner or later is gonna take them away to me, if I can't fulfill their needs of course, but I have courage and hope that I can do it all alone, that "Raising the Kids". I'm hoping too this promo will help me. I'll be praying while continue working. Actually I'm only a tutor at home, I didn't finished college yet, but I will still go to college when my time is up. Hope and Faith I have. I have GOD in me. God Bless! "Maybe i born to be an ENTREPRENEUR woman.That always run into my mind,everyday.Because,since ELEMENTARY i started a little way i can to have an INCOME | LITERALLY TO HAVE ALLOWANCE (to have baon,to buy bondpapers and so on, just to have PROJECTS to passed, to have a little to share to my Family).I bought 1pck of HIRO BISCUIT/VOICE/PRESTO any would be available at the wholesale market at our town,then i made a mark up with PHP 1.00 in each pack of biscuit in Total i had to collect PHP10.00 ,the next day i would choose another biscuit | sometimes CANDY OR GUM i made it ALTERNATIVE (so that my Classmates dont make UMAY of my PANINDA).And if the Tamarind Tree had it full bloom in creating fruits,i made a home-made tamarind jam (packed it individually in an ice tube plastics,and sealed it with a KATOL).Im selling it for PHP2.00 each,my PUHUNAN is total of PHP30-40(gas |brown sugar | ice tube plastic | 1pc katol) .Sometimes i made a BANGKILING JAM TOO,it is a sour tiny fruits colored yelow the bigger it is,the better, same procedure and ingredients as making TAMARIND JAM. I have a poor family my Mother got sick of ( Brain tumor) thats why i decided to stop at my GRADE 5,to take good care of her.My STEP FATHER is just a FISHERMAN then,(my real father when im just a baby already PAST AWAY). But my Mother died also year 2003.And i keep encouraged myself,my sisters just to go on life. In my HIGH SCHOOL DAYS,still with my partime small "business",but that day sometimes im selling items like PONYTAIL,HAIR ACCESSORIES from my TITA in MANILA (takenote this time may utang na,syempre my LISTAHAN na ako). My tita help me to arouse from my deep test of my life.I graduated HIGH SCHOOL with that way of life,im selling PUTO-SEKO too,it made me so happy ,because i have an interest to collect half from my PUHUNAN (PHP12.00| 12PCS\PACK | selling PHP2.00 each). In my collage and until still selling items (bags,RTW,wallet,yes PACKAGE TOUR too) tru ONLINE such as INSTAGRAM | FACEBOOK | TWEETER .In now a reseller too of local ,legit online shop.Im not going to stop of my dreams to have my OWN BOUTIQUE too.Because its not IMPORTANT how big THE PUHUNAN is,but HOW DEDICATED YOU ARE TO BE in a BUSINESS.That your heart is into it,no matter what. Now im PRAYING TO BE LINED UP at your CHOICES of names of this AWESOME GIVEAWAY,that can support woman that love business.Thank you so much for this GREAT | BIG | PRECIOUS OPPORTUNITY MS.SARAH. HOPE TO MEET YOU SOON,IN WHATEVER EVENT YOU HAVE.THANK YOU AGAIN,HAVE A GOOD DAY! And more BLESSINGS TO COME ONTO YOU! Gusto kong magkaron ng sariling business para sa family ko. Ako lang ang inaasahan ng family ko simula ng ma stroke and husband ko. Been doing everything since then to make ends meet. Kung papalarin po, this would really be a great help for us and perfect para mas maalagaan ko ang husband ko while earningat the same time. I wanna own a business because it would help me to finance my studies and my needs. It will also be a big help for my family and will help me achieve financial freedom. By having my own business;I will also be able to help some people(hindi man lahat) to also earn for their own families. Achieving my goal to be successful and helping at the same time even in a smallest ways is priceless. I want to have a business because I want to become independent grown-up so that I will not depend more on my parents and to be successful and have my own time to do what I want without the hassle of time,work and boss at all and to prove to everyone I can be someone they will look after and will serve as an inspiration to future generations. I want to have my own business because I want to be able to have full control of my time and myself! I also know that if you want to really get rich someday, you should really stop just being an employee! I also believe that Beachborn is really a good product to sell since many people trust this product and make it a staple especially this summer. I want to have my own business because I want to be an independent woman who can be an inspiration to a lot of young woman out there. Even though you're a teenager it should not stop you from having your own business, these things can help you build your character and provide for your own self so we can stop being dependent to our family which can help lessen up the bills in our home and also to the expenses of our parents. Having my own business can help me a lot because it can provide things for myself and also to my family which is giving back my gratitude to them. If you have your own business it can help you achieve your life goals little by little. 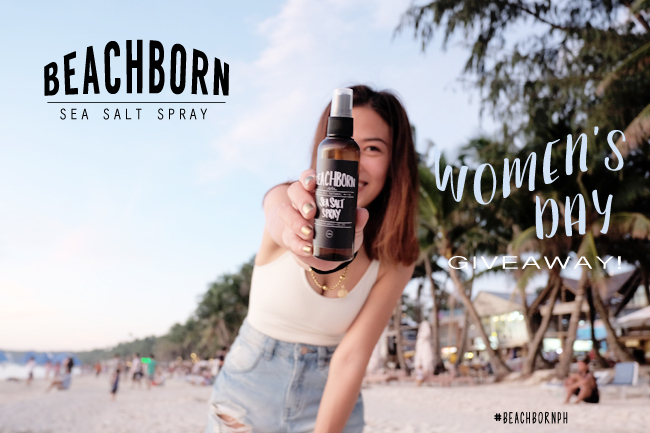 Beachborn is a very trendy and trustful product because summer is starting and a lot of women out their want to have a natural-looking body and bouncy hair that makes us more beautiful and eye catching. I want to own a business because I believe I am born to be an Entrepreneur. When I was in high school, I used to sell foods with my classmates in our school because I want an extra money for myself. Then I was in college, I used to open an online store and sell clothing for me to have an extra money again. Then I graduated, I stopped doing business because my priority is my work. Now, I am a full time mother who does not have a plan on going back to work because my son needs me more. I want to start again having a business so that I can have my own money without relying into my husband. I want to have my own income and share it with my family. I want to save money for the future of my son especially his education. I want to help my father since we are still living in his house and I want to help in the expenses of food and bills. I want to be independent that I don't want to depend on my husband and my parents anymore. So if given a chance, I want to have this opportunity for me to start where my heart truly belongs which is business. I was not born with a silver spoon. So after a couple of years in college, I stopped so I could work and help support my family's needs. The BPO industry has been my refuge. I have learned so much about how business works and it immensely honed my skills. It helped me send my siblings to college and now that things are quite stable, I feel that it's about time that I fill in the void that is missing -- a diploma. I fortunately got accepted in a reputable online university however, it is not a walk in the park since I have erratic work schedule. That being said, I want to have my own business so I can have financial freedom while I pursue my studies. I believe that I have the passion and the skills to handle a business like Beach Born. I understand that it won't be easy but at least I have the time in my hands which will make studying a breeze while I still earn to pay the bills. Thanks for this opportunity, Sarah!